You can reach me at shaunna@harristire.com. 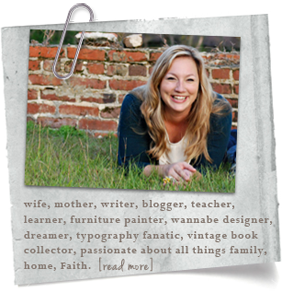 I’d love to answer any questions or talk with you about featuring YOU on my blog! Want to have my opinion on your furniture? Send me a 4x 6 picture, along with any information you’d like me to know, and it might be selected for a Muse My Furniture post. Contact me at musemyfurniture@perfectlyimperfectblog.com. perfectlyimperfect now receives around 100 emails per day, and I do my best to answer as many emails as possible. If emailing about Creating Your Masterpiece, you should hear back within 24 hours. If you send an email (with any subject) and you’ve not heard back within 48 hours, feel free to resend. Thanks so much!